Computed tomography scans of 2 patients with pancreatic endocrine tumor (PET) in the head of the pancreas abutting the mesenteric vessels. A, The PET is in the uncinate portion of the pancreatic head and lies abutting the posterior surface of the superior mesenteric vein (SMV) and superior mesenteric artery (SMA); B, The PET is in the anterior portion of the head of the pancreas abutting the anterior and lateral wall of the SMV. These patients could have the PET dissected off the SMV. CBD indicates common bile duct. Coronal planar reformation (A) and axial tomogram (B) of a computed tomogram of the same patient with a locally invasive nonmetastatic pancreatic endocrine tumor (PET) obstructing the proximal portal vein. The PET has calcifications. There are extensive collateral veins because of the portal vein obstruction. This patient had the portal vein resected and reconstructed with autologous femoral vein. Coronal plane computed tomogram of 2 different pancreatic endocrine tumors (PETs). A, A large tumor is in the uncinate portion of the pancreatic head that is abutting the superior mesenteric vein (SMV). The PET is compressing the SMV and altering its course. The gastroduodenal artery (GDA) is also labeled. B, A locally advanced PET is in the pancreatic head that is obstructing both the SMV and common bile duct. The patient presented with jaundice and had a stent placed in the common bile duct. The PET is blocking the SMV, and one can see extensive collateral veins in the tributaries proximal to the SMV blockage that are returning blood from the gut to the liver. Gadolinium-enhanced magnetic resonance imaging (A) and selective arteriogram (B) of a pancreatic endocrine tumor (PET) that was in the wall of the right hepatic duct. The tumor was abutting the right portal vein. There is a second liver tumor shown on the hepatic arteriogram (B) as a liver hemangioma. The PET was locally resected with the right hepatic duct. The tumor was dissected off the portal vein. Kaplan-Meier plot of total survival (A) and disease-free survival (B) of the 44 patients with pancreatic endocrine tumors involving major vascular structures who had the tumor removed surgically. The actuarial 10-year overall survival was 60%, and the 10-year disease-free survival was 30%. Kaplan-Meier plot of total survival (A) and disease-free survival (B) based on the clinical production of a hormone (gastrin and glucagon); that is, defined as functional pancreatic endocrine tumor (PET) vs nonfunctional PET (NF-PET). Functional PET had a significantly better overall survival than NF-PET (A; P < .001), but there was no difference in disease-free survival (B). Background Surgery for pancreatic endocrine tumors (PETs) with blood vessel involvement is controversial. Hypothesis Resection of PETs with major blood vessel involvement can be beneficial. Design The combined databases of the National Institutes of Health and Stanford University hospitals were queried. Main Outcome Measures Operation, pathologic condition, complications, and disease-free and overall survival. Results Of 273 patients with PETs, 46 (17%) had preoperative computed tomography evidence of major vascular involvement. The mean size for the primary PET was 5.0 cm. The involved major vessel was as follows: portal vein (n = 20), superior mesenteric vein or superior mesenteric artery (n = 16), inferior vena cava (n = 4), splenic vein (n = 4), and heart (n = 2). Forty-two of 46 patients had a PET removed: 12 (27%) primary only, 30 (68%) with lymph nodes, and 18 (41%) with liver metastases. PETs were removed by either enucleation (n = 7) or resection (n = 35). Resections included distal or subtotal pancreatectomy in 23, Whipple in 10, and total in 2. Eighteen patients had concomitant liver resection: 10 wedge resection and 8 anatomic resections. Nine patients had vascular reconstruction: each had reconstruction of the superior mesenteric vein and portal vein, and 1 had concomitant reconstruction of the superior mesenteric artery. There were no deaths, but 12 patients had complications. Eighteen patients (41%) were immediately disease free, and 5 recurred with follow-up, leaving 13 (30%) disease-free long term. The 10-year overall survival was 60%. Functional tumors were associated with a better overall survival (P < .001), and liver metastases decreased overall survival (P < .001). Conclusion These findings suggest that surgical resection of PETs with vascular abutment/invasion and nodal or distant metastases is indicated. Recent surgical series in pancreatic adenocarcinoma question this approach.11,14,17-19 The operability of pancreatic tumors is usually defined by the results of computed tomography (CT).9-11,14,20,21 However, these studies may not always accurately determine operability.14 For example, in patients with adenocarcinoma of the pancreas, when preoperative CT suggests that the tumor involves the SMV, SMA, or PV, many surgeons say that it is inoperable.11,14,17 However, recent studies dispute this thinking and suggest that these locally advanced tumors may be resectable for benefit.11,14,17,22-24 Sarcomas involving blood vessels that were previously thought to be inoperable have been recently resected with acceptable morbidity and good survival.25 Because PETs are rare, there have been no systematic studies of the ability to surgically resect malignant PETs thought to abut or involve major vascular structures, with most reports involving only a few PET patients.9,10,26-33 In this study, we report our long-term results with PETs that abut or involve major vascular structures, including the PV, SMV, SMA, IVC, splenic vein with large collaterals, and the heart (interventricular septum). The findings suggest that possible/definite major vascular involvement on preoperative imaging studies should not be a contraindication to PET resection. Forty-six patients (17%) were identified on preoperative imaging studies as having pancreatic PETs either involving the IVC, heart, or PV or abutting or encasing the SMV (Figures 1-3), SMA, or splenic vein with extensive collateral veins (Table 1 and Table 2). Thirty functional PET patients presented with symptoms related to Zollinger-Ellison syndrome (peptic ulcer disease, gastroesophageal reflux disease, and diarrhea), and 2 glucagonoma patients presented with a rash that was later called necrolytic migratory erythema. Although the nonfunctional PET patients each presented with pain, 6 functional PET patients also had pain as a presenting symptom (Table 1). For the patients with functional PETs, symptoms were present for approximately 5 years before the diagnosis was made. The median gastrin increase for the Zollinger-Ellison syndrome patients was 12-fold (Table 1). Table 2 presents preoperative tumoral features assessed by imaging studies. Three primary tumors were ectopic: 2 in the interventricular septum of the heart and the other within the wall of the right hepatic duct abutting the right PV (Figure 4). Forty-four of the 46 patients (96%) underwent surgery (2 refused surgery), and in 42 patients the primary tumor was resected (Table 3). Fifteen patients had vascular encasement located in the heart (n = 1), the IVC (n = 1), the SMA (n = 1), and the PV or SMV (n = 12) (Figures 2 and 3B and Table 3). Resections included partial pancreatectomy (either distal or subtotal pancreatectomy) in 23 patients, Whipple proximal pancreaticoduodenectomy in 10, and total pancreatectomy in 2 (Table 4). Eighteen patients (41%) had concomitant liver resection: 10 (23%) had wedge resections and 8 (18%) had anatomic resections (Table 4). Nine patients (20%) had vascular reconstruction: each had reconstruction of the SMV and PV, whereas 1 patient had concomitant reconstruction of the SMA. The median (range) operative blood loss was 500 mL (200 mL-6.2 L). The median (range) hospital stay was 9 (7-33) days. Table 4 presents the type and results of surgery, follow-up, and complications. The 10-year actuarial overall survival is 60%, and the disease-free survival is 30% (Figure 5). Possible prognostic factors were examined to determine whether they affected overall and disease-free survival. Most variables did not affect disease-free survival (Table 5). Patients with functional tumors had a greater long-term overall survival than those with nonfunctional tumors, but the disease-free survival was similar (P < .001) (Figure 6). The presence of lymph node metastases did not decrease disease-free survival. However, disease-free survival was decreased from 66% to 10% by the presence of liver metastases (P = .002) as well as by the use of liver resection (P = .007). The use of vascular reconstruction did not affect disease-free survival (Table 5). The use of other anti-tumor treatment following surgery significantly decreased disease-free survival (Table 5). This article focuses on the role of surgery in removing PETs abutting, invading, or encasing a major blood vessel, usually the SMV or PV (Figures 1-3), as well as removing the primary tumor, lymph nodes, and any limited liver metastases in these patients. This study was undertaken for a number of reasons. First, a proportion of PETs show aggressive, malignant growth, which is associated with decreased survival, and the medical treatment of these large, advanced tumors is generally only marginally effective.67,71-73 Second, a number of studies have shown that vascular invasion in patients with pancreatic adenocarcinomas and those with advanced PETs is associated with decreased survival.2,4,11-15 Third, there are a number of surgical reports by different groups that resection of distant metastatic PETs, including those within the liver, may improve survival.38,50,74-77A recent consensus statement recommended that patients with limited liver metastases be considered for resection.3,38,50,71,74,75,78 Fourth, recent studies in patients with exocrine adenocarcinoma of the pancreas—similar to PETs—suggest that these tumors, even when invading venous structures, may be resected with acceptable morbidity and benefit.11,14,17-19 Similarly, resection of invasive sarcomas of the extremity and retroperitoneum that involve major blood vessels, resulting in the complete removal of tumors previously thought to be inoperable, has been recently reported with favorable outcomes.27 Furthermore, numerous series suggested a similar approach might be feasible and perhaps beneficial in patients with advanced functional9,28,79-81 and nonfunctional PETs.9,29,30,33,82-84 Fifth, an aggressive PET can also cause dramatic life-threatening complications, such as massive bleeding, because of the formation of vascular shunts27 or short gastric varices in the setting of splenic vein occlusion by tumor.80,83-86 Successful resection of these primary PETs, even in cases of early vascular involvement, may significantly delay or prevent the occurrence of such complications. Unfortunately, our study, like many other surgical series of patients with advanced PETs, including those with liver metastases, does not clearly establish the value of the surgical approach taken.76-78,90 Nevertheless, a number of findings in our study are suggestive of surgical benefit. First, despite the decreased survival of patients with vascular involvement and/or liver metastases with malignant PETs,2,4,12,13,71,72 the overall survival rate was 60% at 5 years and 30% of patients remained disease free. These data are encouraging because, in historic controls, patients with metastatic PETs with vascular involvement who did not undergo surgery had a 5-year survival rate of 30% to 40%.89,91 Second, in our study, these results were obtained in the setting of major pancreatic resection (79%), plus liver resection in 41%, vascular dissection in all, and reconstruction in 20%. 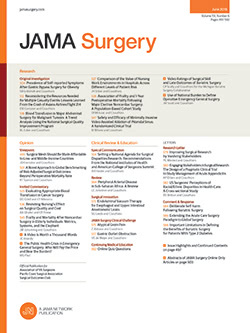 Despite this extent of surgical dissection, there was no surgical mortality, and the surgical complication rate (27%) was well within the range of that reported in previous studies with PET resections by means of lesser procedures.1,92,93 Third, in the present study, 5 patients presented with upper gastrointestinal hemorrhage from gastric varices secondary to splenic vein occlusion by the PET, and the bleeding was totally ameliorated by removal of the tumor with the spleen. This experience is similar to that reported in a small number of case reports.8,83,85-87,94-96 These results suggest that the resection of the PET despite vascular involvement is of particular benefit in this group of PET patients. Fourth, medical therapies of advanced PETs have provided only modest benefits, with many studies reporting short-term disease stabilization and a small percentage of partial responses.71-73,97 Therefore, it has generally not been possible to downsize extensive disease in a patient with a malignant PET to make it surgically resectable, as has been performed in some other tumors.71-73,98,99 Our data suggest that major vascular involvement is not a contraindication to surgery. Because radiographic evidence of vascular involvement represented 20% of our PET population, these findings apply to a significant number of PET patients seen in the community, and such patients should be referred to a tertiary care facility where multidisciplinary expertise is available. Correspondence: Jeffrey A. Norton, MD, Department of Surgery, Stanford University Medical Center, 300 Pasteur Dr, Room H-3591, Stanford, CA 94305-5641 (janorton@stanford.edu). Accepted for Publication: May 20, 2010. Author Contributions:Study concept and design: Norton, Harris, Chen, and Jensen. Acquisition of data: Norton, Harris, Chen, Visser, and Jensen. Analysis and interpretation of data: Norton, Chen, Poultsides, Kunz, Fisher, and Jensen. Drafting of the manuscript: Norton and Jensen. Critical revision of the manuscript for important intellectual content: Norton, Harris, Chen, Visser, Poultsides, Kunz, Fisher, and Jensen. Statistical analysis: Norton, Chen, Fisher, and Jensen. Obtained funding: Norton and Jensen. Administrative, technical, and material support: Norton, Harris, Chen, and Visser. Study supervision: Norton and Kunz. Funding/Support: This study was partially supported by intramural funds of the National Institute of Diabetes and Digestive and Kidney Diseases, National Institutes of Health.